So we have just gone through another very successful conference and Annual General Meeting for the Canadian Standard Association (CSA). Canada is a very large geography with a very small population, but CSA continues to demonstrate its commitment to being a national (and international) organization by ensuring that the AGM travels across the country, touching every province through its cycle. In my short connection with CSA AGMs I have been to 3 different provinces and with the now established plans there will be 5 different provinces over a 6 year period. The AGM is an interesting mix of organizational information, standards oriented presentations, and working committees, and a broad array of expert presenters, all put together to bring together a very eclectic group of folks with interest or passion for national and international standardization. We standards people are indeed an interesting lot, who all approach the field from our own perspectives. There are some who are truly entrepreneurs with a commodity perspective, some seeing income generating consultant opportunities. There are some who focus on the production of standards with a purist point of view; create good standards for the sake of making good standards, while there are others, who are passionately involved in their work sector and approach documents as a way of improving service to their own field of interest. Then there are the regulator types who like rules creation; they are balanced by the educator types who are mostly interested in standards mostly as valuable opportunities for research and outreach through academia. And then there are the “just curious” and the the rest who just like being there for the sake of being there and having a good time. Motives for attendance and participation are wide and varied, but it seems to me that there is something for everyone and solid reasons for being there. As for me, I see my motivation as being a combination of many of the above. I am certainly committed to healthcare and see one of my roles as a Quality leader and educator and standard developer, and am not ashamed of finding opportunities to intermittently promote my knowledge as a consultant and public speaker. but I can honestly say that I am also at these meetings because I get to meet interesting folks and have a good time. This range of views attitudes is actually very important for standards development. If we were all of one point of view, the standards that get written would likely become very narrow, and very difficult to use. Without diversity of opinion, there is little need to seek out consensus. I personally do not see standards as black-or-white precision documents; you might say I have a more nuanced, shades-of-grey perspective. In most cases, at least in my area of interest, standards need to include a significant sense of flexibility that is, within a certain range, open to interpretation. If they are going to be available on tablets, they have to be of the electronic kind and not Mount Sinai stone. But I also recognize that if all standard people approached documents my way, the products would be too fluffy to be of value. On the other side, the precision-driver-obsessive-compulsive-kill every-loop-hole folks without my counterbalance would create tomes that best belong in tombs. So this is my point, folks interested in being engaged in standards are always enhanced by attending conferences with people with the broad range of views. We get the opportunity to express our point of view and at the same time experience tempering through competing ideas. Working on standards in isolation of diversity of opinion makes for bad standards. 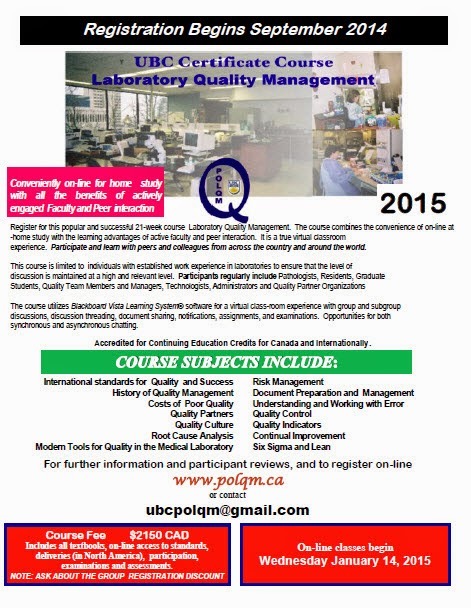 To learn more about Standards Development, visit www.polqm.ca and consider joining our Certificate Course in Laboratory Quality Management.